Stunning modern structures for corporate events. 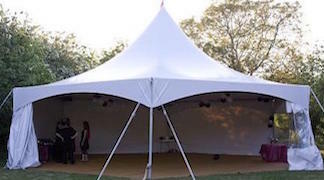 Make an impact with Saddlespan display tents. 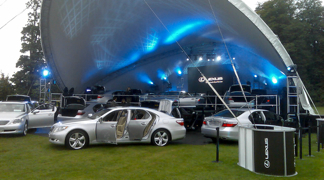 Design your event space using Matrix Modular Marquees. Saddlespan Duo-Span for larger events. Promote your message with branded structures and banners. Sponsorship opportunities with our branding options. Flags, banners, branded flooring, backdrops. Speak to us about the various options for each of our products. Create an impact with these classic modern beauties. 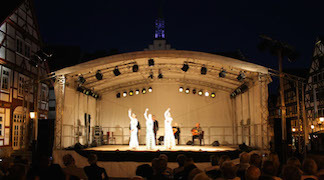 Enclosed as an ideal venue for conferences, exhibitions, fashion shows, dinner dances. Open as a stunning display area for product launches, demonstrations, stage covers. Ideal for roadshows, promotional events and tours. Looks fantastic and can be installed virtually anywhere in as little as two hours – perfect when you need to be in and out fast. Easily branded for promotional events. Versatile, modular and clear-span making them incredibly useful for all kinds of events.